Betta | Zoo Med Laboratories, Inc.
A Betta should be kept in no less than one gallon of water. Zoo Med’s Betta Condo and Betta House are excellent choices for Bettas. An aquarium substrate such as Aqua Accents provides living space for beneficial bacteria and will help keep your Betta tank clean. Provide decorations and hiding areas such as Betta Plants, Ceramic Betta Log and Floating Betta Log. Bettas are tropical fish. Your Betta’s tank should be kept between 74 and 80°F. A BettaTherm® Mini Size Betta Bowl Heater will help maintain proper temperatures in your Betta’s Bowl. It is important to keep your Betta’s water clean. Do partial water changes once a week to keep your fish healthy. Be sure to use a water conditioner such as Zoo Med’s Betta H2O Conditioner to remove chlorine and chloramines from tap water. 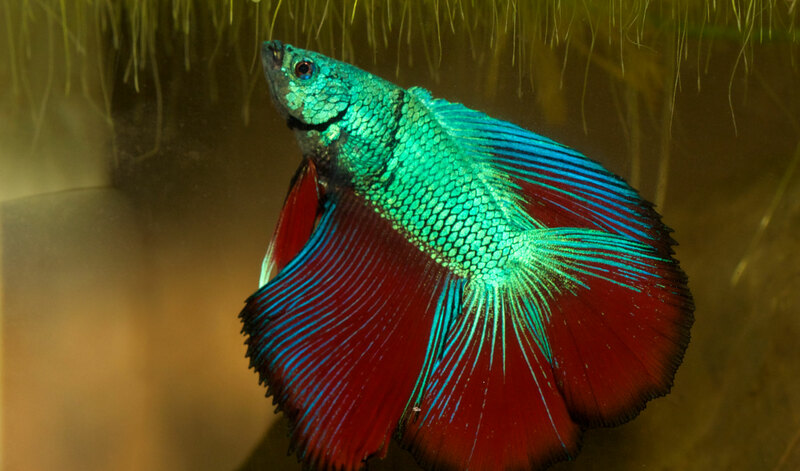 In the wild, bettas eat small insects, worms and crustaceans which provide high levels of proteins and fats. A variety of foods should be offered to keep your Betta healthy. Zoo Med’s Dial-A-Treat is a great supplemental food for Bettas and should be offered twice a week to add variety to the diet. Dial-A-Treat contains frozen or dried blood worms, mysis shrimp, daphnia and brine. Always remove uneaten food from the tank after about 5 minutes to prevent polluting the water. A BettaMatic® Automatic Daily Betta Feeder or Betta Banquet Blocks will help you feed your Betta for up to a week when you are out of town! Bettas are “lazy” fish that spend a great deal of the day “laying around”. A Betta Leaf Hammock provides a resting place near the surface of the water for your Betta. Bettas are territorial fish and should never be housed together. The sight of another Betta will trigger the fish to put on a threat display. He will flare out his fins and “dance” back and forth showing off his fins. A Betta Exercise Mirror allows your Betta to practice this natural behavior for a few moments a day. Bettas will often “attack” their food as soon as you put it in the tank. They can even be trained to eat pellets from a feeding wand!